Sabotage: Saraki knocks Customs over smuggling – Royal Times of Nigeria. Saraki spoke when the Chief Executive Officer (CEO) of Anadariya Farms, Alhaji Usman Dantata Jr. led representatives of the Poultry Farmers’ Association of Nigeria on a visit to him in Abuja. He berated the Nigerian Customs Service the un-abating rate of smuggling while urging them they step up their game to quell smuggling in Nigeria so that agriculture can become more profitable. 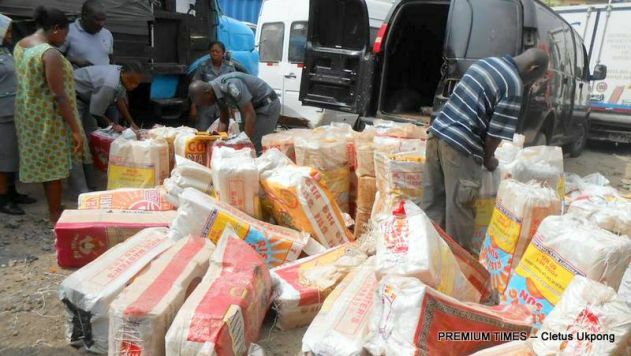 According to a statement by Special Assistant on Print Media, Chuks Okocha, Saraki also tasked the Nigerian Customs Services to step up its anti- smuggling campaigns in rice, chicken and other items. He said that Nigeria could no longer remain a ” dumping ground for imported smuggled goods. “We will see what we can do particularly on the issue of non-payment of compensation to farmers that lost their birds to the Avian Influenza. These farmers who are doing well, need our encouragement. “This is where government will show true interest in Agriculture and ensure that all compensation are paid. So, Chairman Committee on Agriculture, take note and meet the Ministers of Agriculture and Finance and see what we can do. “The second issue you raised which has became a very big issue is the issue of smuggling. We all know that about 40 to 50 per cent of poultry products are still being smuggled into the country and this is bad. “Something needs to be done about it. Nigeria Customs must sit up because it is an economic sabotage. It is now that we must stop this smuggling particularly on Agricultural products like rice and chicken. “We will take this up aggressively. Without that, we are only wasting our time. “Nothing we are going to do at this level in support of agriculture if products are still going to be smuggled in. “Chicken is still being smuggled in. Rice still being smuggled in. “This is something we must fight as a nation. This is economic sabotage we are talking about and the management of the Nigeria Customs must rise up. “Either they are ready to do it or we give it to people that are ready to do it. “If there are challenges the Nigerian Customs is having, let them tell us. We are ready to support them. This is a fight we must win. On access to finance, the Senate President said, “I am surprised and this is the aspect we have to take up. Organizations like yours are borrowing money from banks at 25 per cent interest rates. I think the Chairman of Senate Committee on Agriculture has a lot of work to do here. If we have organizations that are serious, the Central Bank must give them total support, it is clear that they need more support,” he said. The problem of smuggling seems to have defied a lot of policies as government now intends to use technology to check the menace. Earlier, the leader of the group, Alhaji Dantata Jr. lamented the non-payment of compensation to all the farmers who lost their birds during the last outbreak of bird flu in the country. He insisted that the progress of poultry farming in the country is greatly being undermined by the activities of smugglers and high interest rates being charged by commercial banks in the country. Dantata said: “We humbly request you to implore the Nigeria Customs Service to do more to curtail the level of smuggling. We are equally concerned about difficulties in accessing finance for poultry and other agriculture production by most farmers. “Where available, the interest rate is between 25 to 27 per cent and the collateral terms are very stringent and the tenor of loan very short which does not match with long term nature of our business and the potential cash flow available for debt service of agriculture business in Nigeria”, he said.